Exercise TIGER SOAR 15 was a two week Adventurous Training Expedition in the French Alps run by the Army Gliding Association (AGA) 18 Apr – 3 May 15. Seven Army glider pilots deployed, two of whom are reservists: Lt Col Ian McFarlane YORKS and Maj Jamie Sage RE (Chairman AGA). Both Jamie and Ian are instructors at the Army clubs at Upavon and Wattisham Airfields. The group included two experienced mountain instructors, of which Jamie was one; one instructor on a development programme and four experienced pilots ready for advanced development. The expedition was based at Sisteron Airfield to facilitate advanced training and cross country flying into the mountainous terrain where thermal (warm air rising) and dynamic (wind onto ridges) lift conditions enabled flights lasting more than 6 hours and in excess of 500Km. Jamie is an experienced Alpine and mountain instructor with four Alpine expeditions in his log book and he flies regularly at a mountain site in Wales. His role was to train and supervise the other pilots to the new challenges of this environment. This was Ian’s first experience of the Alps; he began with flights in a two seat glider to familiarise himself with the area and begin to understand how this challenging environment interacts with the elements. He was taken to a variety of ridges and shown the new skills required to fly safely and efficiently often within 50m of imposing rock faces. New navigation techniques were learned and emergency landing procedures practised with a requirement to stay in range of known emergency outlanding sites (suitable fields are few and far between in this part of the world). After 8 hours of gruelling lessons, Ian was despatched for a 3 hour local solo sortie to consolidate his new skills. With the prospect of stronger winds the next day, Jamie and Ian planned a flight to exploit conditions which allow flights into much higher airspace. 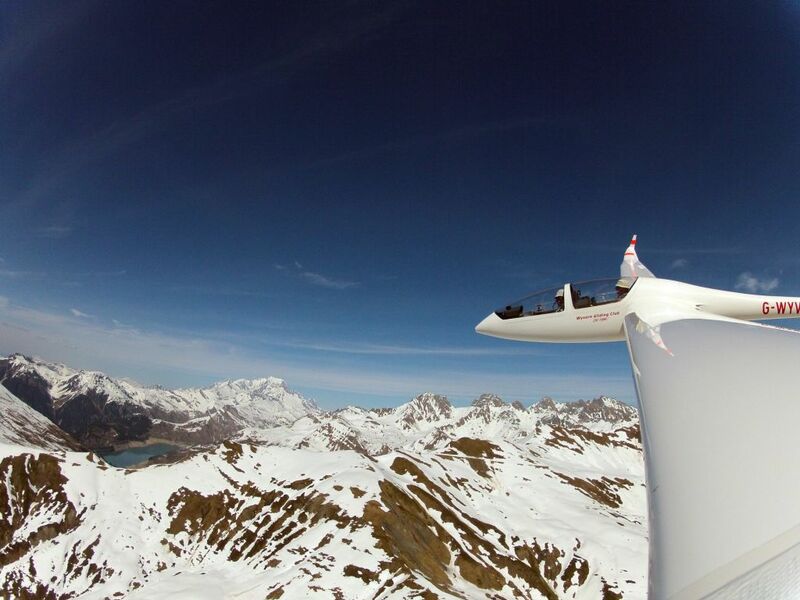 The wind “bounces” upwards and enables gliders to achieve altitudes of 20,000 feet and higher above sea level. After ensuring that their Oxygen systems, radios and procedures for high flying were in order, the pair launched and worked their way upwards using the system of ridges and peaks that provided the lift. Using Oxygen at altitudes greater than 10,000 feet, Jamie and Ian soared for over an hour beneath the clouds at 15,000 feet and explored some areas of the Alps into which Jamie had not previously flown. As the expedition continued, confidence and abilities improved so that a plan was made for an iconic flight to Mont Blanc. Jamie and Ian were in separate dual seat gliders and flew a similar route northwards, into the higher ground. Conditions weren’t as good as forecast, but as Ian was in a higher performance aircraft with another instructor; they made their goal at Mont Blanc. 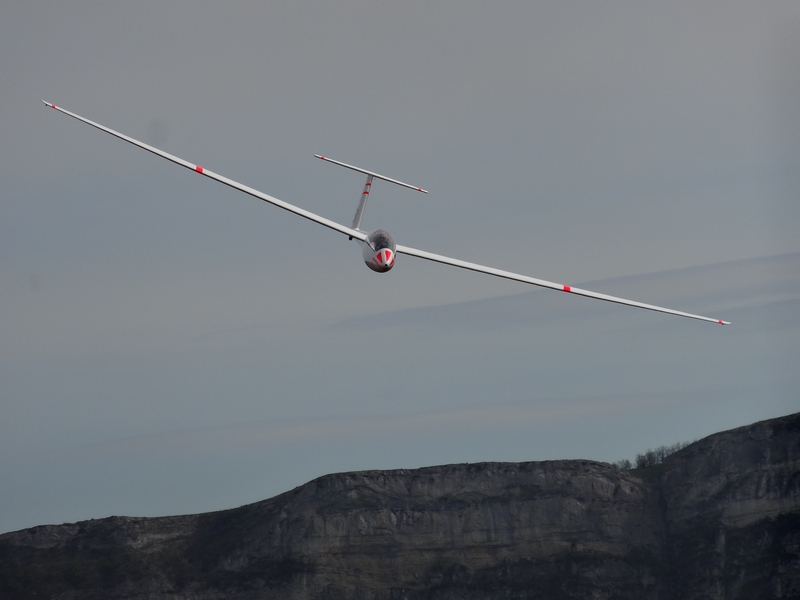 Jamie’s glider was more limited so he had to revise his objective and decided to explore the Grenoble – Albertville Valley and meet with Ian’s glider on their return. The favourable conditions declined and by late afternoon, both gliders were struggling to find sources of workable lift. Everyone was now working very hard, using all of the skills learnt but the likelihood of making it back to Sisteron was looking less likely. By now, the gliders were working independently and looking at the options for a safe outlanding. Charts were checked; the list of fields and their details were consulted and plans made. When the safety heights were reached, the gliders flew to their chosen (farmers’) fields, made a recce, and landed – all quite safely. Ian’s glider drew little attention and after contacting their retrieve crew with the details, retired to the local village for a refreshment. Jamie’s landing however attracted a lot more attention, with the local Gendermarie promptly on the scene, quickly followed by a large crowd who hosted an impromptu party until the retrieve crew arrived – by now in the dark. Further training and experience was developed until the final day when Ian was sent solo again, with a plan to conduct a “lead and follow” sortie for a route deep into the mountains. 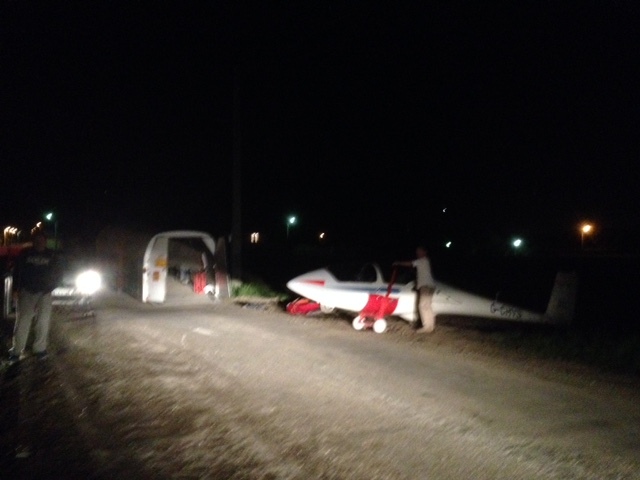 This final flight saw all gliders and pilots airborne and working mutually to complete flights in excess of 250Km. A total of 38 flights for 127 hours were flown, of which Jamie added 35 to his log book and Ian gained a further 32 hours experience. 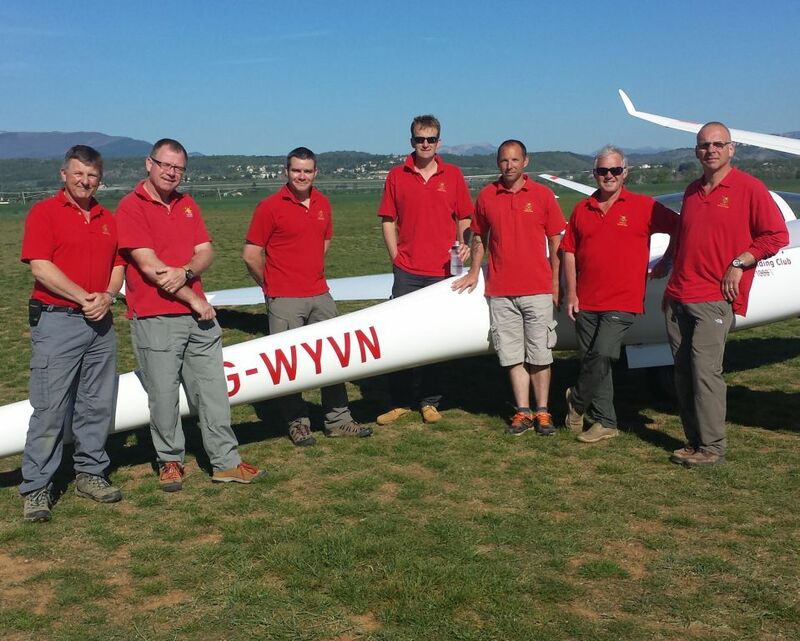 The benefits to individual pilots were considerable and will enable all to take their skills to a higher level, especially during the annual Interservices Gliding Competition at Bicester in August and for instructing students and visitors to their home clubs. We are very grateful to the Ulysses Trust for their generous support for this high level, very committing, Alpine expedition.